Stan Hieronymus joins me this week to discuss his new book “Brewing Local – American Grown Beer” which includes a history of brewing distinctly American beers with local ingredients. Join us for this great episode! Today my guest is Stan Hieronymus. Stan joins us to discuss his new book Brewing Local – American Grown Beer (Amazon affiliate link). Stan is also author of For the Love of Hops, Brew Like a Monk and Brewing with Wheat (Amazon affiliate links). We start with a short overview of Stan’s new book “Brewing Local – American Grown Beer”. Stan explains how for much of history local ingredients were used and beer was brewed locally or even home brewed. Stan explains why European settlers were not the first beer brewers and in fact native Indians in the Southwest brewed beer from corn. We talk about what some Indian beers were like as well as how they created low alcohol ceremonial beers from corn. 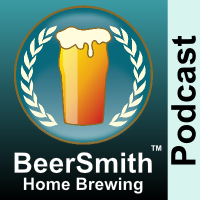 Stan talks about the beers that European settlers brewed when they first arrived. We discuss some distinctly American beer styles that emerged over time including a few that survive to this day. Stan explains how corn made its entry again into beer brewing in the late 1800’s in the US. We talk about the local cultivation of barley, hops, wheat, and corn that were grown in many areas and used across the US. Stan talks about some native ingredients outside of the traditional four ingredients including herbs and other plants. We discuss how some small craft breweries have experimented with introducing these ingredients in their beers. Stan briefly mentions the resurgence of small craft malt houses and hop growers that are beginning to pop up again here in the US. We discuss how craft and home brewing have started to come full circle – again reflecting locally grown barley, hops and other ingredients. Interesting bit about the link between the terms steam beer and lager beer.